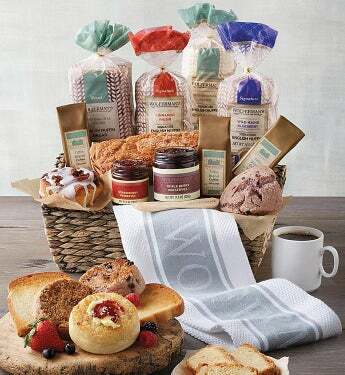 Discover a variety of beloved gourmet specialties in the Bakery Gift Basket. Packed with a medley of delicious bakery delights, including a sampling of super-thick signature English muffins. Decadent breads and pastries, tangy fruit preserves, robust coffee, and even includes a handy kitchen towel and signature wooden spreader. Serve up slices of the decadent baked goods along with fresh brew of robust Tiffon coffee,and it's the perfect gourmet menu to mark a special day--or simply to add brightness and warmth to somebody's morning. While this attractive and reusable basket is a treat to open, the real joy comes with tasting the gourmet delights inside. Discover a variety of beloved gourmet specialties in the Bakery Gift Basket. Packed with a medley of delicious bakery delights, including a sampling of super-thick signature English muffins. Decadent breads and pastries, tangy fruit preserves, robust coffee, and even includes a handy kitchen towel and signature wooden spreader. Serve up slices of the decadent baked goods along with fresh brew of robust Tiffon coffee,and it's the perfect gourmet menu to mark a special day--or simply to add brightness and warmth to somebody's morning.